Does this look familiar? 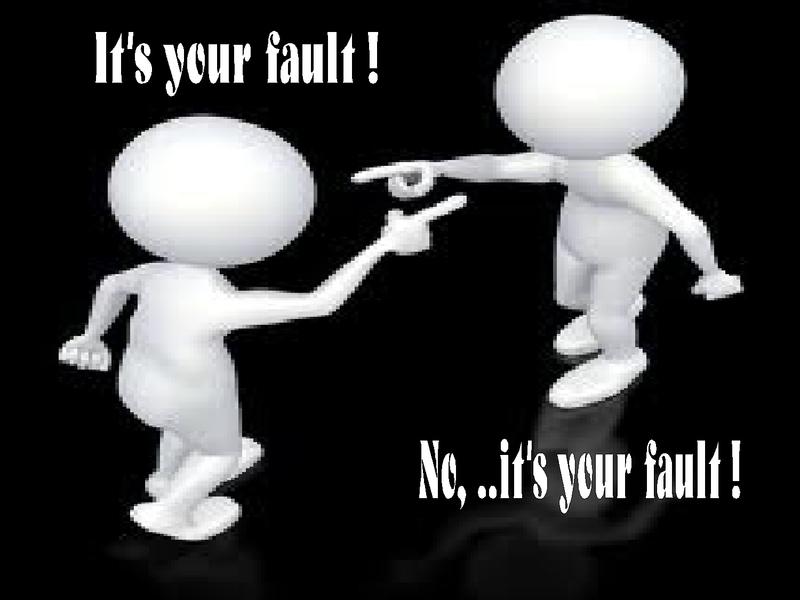 How easy is it to find fault in others, to blame them for something that went wrong? Yea, it is pretty easy, actually.. that is why people do it. If I blame others, that means I am not accountable for fixing it nor am I responsible for the damage it causes. We blame others for the stresses in our lives, for the weight we have gained, for picking up bad habits like smoking and yada yada... BLAME … BLAME ..BLAME. We love it..don't we? Well, not really but it seems that way. The truth is, when we blame others… we give up empowerment and leave behind an opportunity to change. Instead of working on resolutions and changes to ourselves, we push the hard work and effort onto those we blame, who end up doing nothing different. Here we can easily insert the definition of insanity by Albert Einstein - "doing the same thing over and over again and expecting a different result." So, in order to avoid "Insanity", I offer this… Instead of blaming others for the situation, how about we saw it's our fault? Honesty, what can it hurt? When bad things happen, I prefer it to be my fault. When it is my fault, I am empowered to fix it. I can now be responsible and accountable by asking myself "What shall I do about this?". If I am overweight, I need to empower myself to eat better and become more physically active instead of blaming fast food, or stress. If someone stresses me out, instead of blaming them, I can self reflect and see what I need to do to rid myself of the stress. Maybe I need to have a nice sit down with this person, and ask something like.. "I've noticed that things I do seem to bother you to the point we both get stressed out, how can I help us get through this, what can I do better?" This could be the very dialog to minimize stress or...Maybe its removing that person from my life all together. We live in an imperfect world, things are going to go wrong. Its far more empowering to recognize the issue and work together to resolve it than to say, "that is not my fault.. that is not my problem". On the other side, when we blame others, we could significantly affect their mental health. If we blame others enough, we could lower their self-esteem. Did you know that blaming could be perceived as emotional abuse? Newer PostTwo Non-Verbal life hacks!